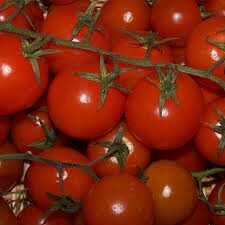 Whether red, green or yellow cherry tomatoes on the vine are an attractive addition to any plate. Boasting a concentrated sweet flavour, enhanced by being able to ripen on the vine these particular tomatoes are delicious eaten by themselves. Perfect served sautéed still on the vine with a little salt and olive oil and salt these tomatoes can transform breakfast if served with scrambled egg and toast by injecting colour and sweetness to the dish. They make a great accompaniment to chicken or fish as their sweetness compliments the more savoury flavours of the meat, especially when roasted beforehand until the skins of the tomatoes just begin to burst.